Egyptian scholars visit the Arkansas State Capitol Building. 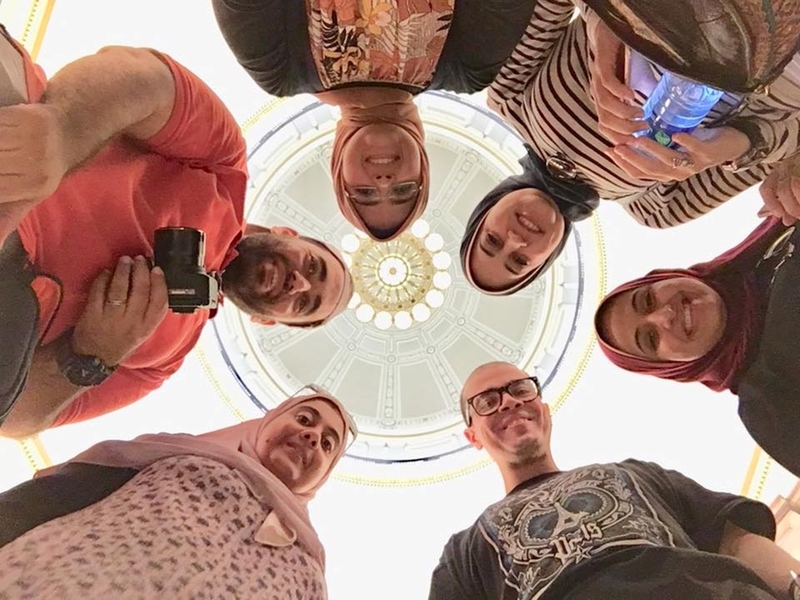 The Spring International Language Center recently hosted six Egyptian scholars as part of the Fulbright Junior Faculty Development Program. The 10-week program was designed to train the faculty in best teaching and research practices. Scholars also learned about leadership in education, academic support structures and grant proposal writing. The faculty will bring their new knowledge to their home country and share it with their peers. Community engagement was an important part of the program as well. During their stay in Fayetteville, the Egyptian scholars shopped at the Fayetteville Farmer's Market, visited with Butterfield Trail Village residents and volunteered at TriCycle Farms. The kindness of Fayetteville residents struck the scholars. "The people of Fayetteville are friendly and open-minded," said program participant Amira Elsayed. "I love how people smiled at me for no reason." By engaging with the community, the scholars helped promote mutual understanding between their home country and Americans. The Fulbright Program, which sponsored the Egyptians, hopes the development program will foster long-term linkages between the scholars and U.S. academics. Bringing international students and scholars to Arkansas is important for the state's economic growth. According to NAFSA: Association of International Educators, international students in Arkansas contributed $160.4 million to the state's economy in the 2016-17 academic year.